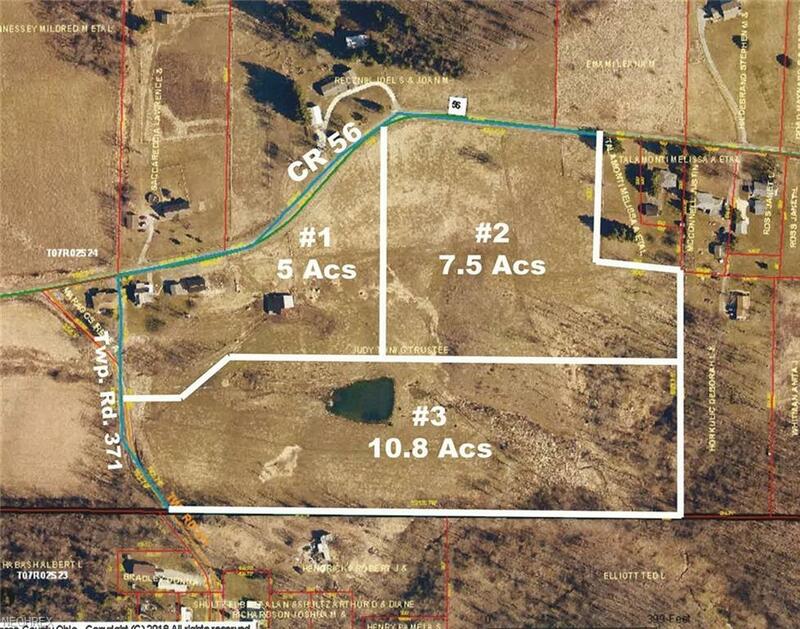 23.3 Acre Farm Sold In Three Parcels - Island Creek Twp. Jefferson Co. Edison SchoolsParcel #1 5+ Acres With Home Garage 2 Pole BuildingsParcel #2 7.5 Acres With Open Land Part WoodedParcel #3 10.8 Acres Open Land Pond WoodsABSOLUTE AUCTION, family owned approx. 70 years, all sells to the highest bidder on location: THURSDAY - SEPTEMBER 13, 2018 6:30 PM.Parcel #1 5+ acres with century frame 1,204 sq. ft. two-bedroom home with eat-in kitchen, bath, living room, family room, porch, covered carport basement with modern FA gas heat and central air, modern breakers, replacement windows, city water, detached 2-car garage with 2 new rollup doors 24 X 40 pole building with water and electric, pole-type barn with loft and lean-to for livestock pasture nice setting. Parcel #2 7.5 acres rolling scenic lots of frontage some woods city water available terrific viewsParcel #3 10.8 acres frontage on side Twp. Rd. 371, pond, pasture, loads of woods, better check it out. Maps at site or visit us on the web. TERMS ON REAL ESTATE: 10% down auction day, balance due at closing. A 10% buyers premium will be added to the highest bid to establish the purchase price, which goes to the seller. Any desired inspections must be made prior to bidding. All information contained herein was derived from sources believed to be correct. Information is believed to be accurate but not guaranteed.